Because wheat, rye, barley, spelt and oats aren’t allowed on Passover (unless they’re in matzo or matzo meal), Passover can be a great gluten-free holiday. You can find gluten-free versions of foods that you can’t find the rest of the year, like gluten-free matzo ball mix, blintzes, cookies and cakes. But be careful to avoid my eternal mistake (when will I ever learn? ), and don’t overbuy Passover products. Passover foods are almost always expensive, but they don’t always taste great. Many foods are labeled “gluten-free” and some are labeled “non-gebrokts” (which is basically the equivalent of gluten-free). Non-gebrokts foods are increasing in popularity because of the growing Hassidic population and gluten-free population. — My top recommendation is Lieber’s Knaidel Mix. This gluten-free matzo ball mix makes light and fluffy matzo balls (called knaidlach in Yiddish). My guests have asked for seconds, unaware that the matzo balls were gluten-free. Another gluten-free matzo ball option is Frankel’s Matzo-Free Balls. These premade frozen gluten-free matzo balls (six to a package) are convenient when you want to take individual gluten-free matzo balls to a relative’s house to drop in their chicken soup. — Don’t let the “breaded” fool you, Spring Valley Breaded Chicken Pattie Nuggets (sorry, I can’t find an online link) are coated with potato starch – a great find, since it’s hard to find gluten-free kosher chicken nuggets. Make sure the bag is labeled kosher for Passover and non-gebrokts. I also bought Spring Valley Frozen Stuffed Chicken Rolls — a good gluten-free kosher quick lunch. Also, it’s hard to find gluten-free blintzes during the year, so I stock up on gluten-free Spring Valley Blintzes, which come in cheese, apple and blueberry flavors. Make sure the box is labeled kosher for Passover and non-gebrokts, as only the Passover blintzes are gluten-free, not the ones they produce the rest of the year. — Frankel’s makes a frozen gluten-free Passover cheesecake that’s great, as well as gluten-free potato knishes and gluten-free blintzes. — Gefilte fish often is part of Passover meals, but most gefilte fish contains matzo meal. For the past few years, I’ve bought Kedem Gourmet Gefilte Fish, which is made without matzo meal, is gluten-free and does not contain MSG. This year, I also spotted Rokeach “Gourmet Sweet” and Rokeach “Heimeshe Sweet” gluten-free gefilte fish. Also, some of the frozen gefilte fish loaves are gluten-free. — Most macaroons are gluten-free, including Manischewitz and Streit’s macaroons, which also use sulfite-free coconut. This year, Manischewitz introduced a frozen gluten-free macaroon dough. — I’ve already discussed gluten-free matzo-style squares and gluten-free oat matzos in other posts, so I’ll be brief here. Yehuda Gluten-Free Matzo-Style Squares are tasty, gluten-free matzos that taste like crispy flatbread crackers. Yehuda also offers a toasted onion flavor and a fiber-enriched version, as well as gluten-free matzo crackers. I still haven’t tried to cook with Yehuda gluten-free cake meal, but some readers have told me that they haven’t been successful with it. This year, Manischewitz came out with its own Gluten-Free Matzo Squares along with gluten-free Passover crackers. — New this year is a seasoned version of Jeff Nathan Creations Gluten-Free Panko Flakes. I used the plain panko flakes last year as a gluten-free crumb coating for chicken and fish and liked their texture. But they didn’t have much taste, so I’m happy to see a seasoned version. — I hate it when I open a bag of tapioca starch and get coated in a puff of white powder. So I like the fact that Gefen Tapioca Starch comes in an easily reclosable canister. I also like the reclosable canisters of potato starch from a few Passover brands. 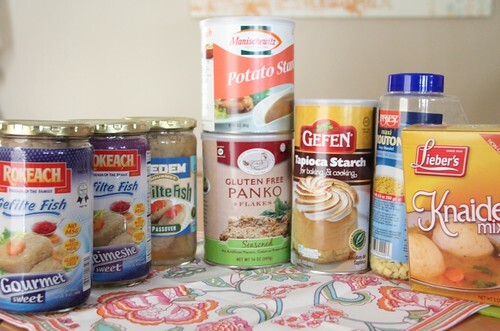 — Dr Praeger’s offers some nice gluten-free options year-round and even more during Passover. I bought “Potato Crusted Fishies,” though now my kids have informed me that they will not eat fish sticks. Go figure. — You can now buy so many gluten-free cookies, crackers and cakes throughout the year, it doesn’t make sense to buy the Passover versions, which are generally less nutritious and less tasty. Sometimes I’m tempted to buy the boxed bakery-style cookies, though most tend to be expensive and sugary. Still, it is sometimes nice to keep a box or two in the freezer. Shabtai Gourmet, a kosher bakery, is dedicated to baking gluten-free Passover goodies year-round. Oberlander’s , Schick’s and Hagadda also have a selection of gluten-free, bakery-style Passover cakes and cookies. I skip the Passover cake mixes; they’re generally not great. There are some frozen cake loaves that can be worthwhile, such as Osem marble cake and pound cake, which are small and easy to keep in the freezer. — Generally, I skip the Passover noodles, pizza, pancakes and waffles. They usually end up mushy and gummy. Although this year I did buy frozen Heaven and Health gluten-free potato gnocchi. — I’m always tempted by snack foods. I love all the boxes of chocolate available at Passover, though check the ingredients — not all are gluten-free. 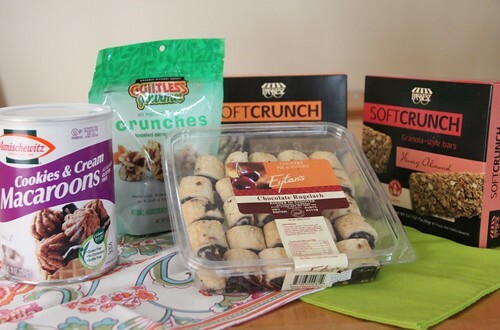 For snacks this year, I bought Guiltless Gourmet Crunchies nut squares and Paskesz Soft Crunch granola-style bars. 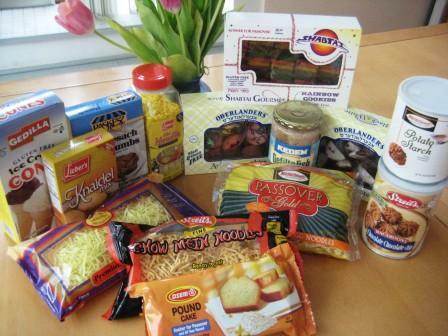 Click here for my shortened, printable gluten-free Passover shopping list. 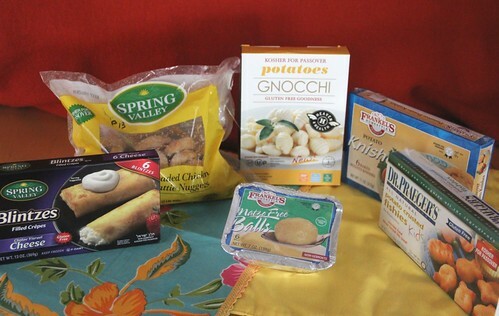 Update: For 2012 gluten-free Passover foods, see my recent blog post. The 2010 post is below. On Passover, we recall how the Israelites were slaves in ancient Egypt. To remember the unleavened bread they ate when they left Egypt, we don’t eat certain grains during the eight days of Passover. That means wheat, rye, barley and oats are prohibited (other than the grain used to make matzah). As a result, many kosher for Passover foods are also gluten-free. Check to make sure the labels say “kosher for Passover” and that the ingredients do not contain any form of matzah (which can be labeled as matzah, matzah meal, cake meal or farfel — all of which contain wheat). Many Passover foods are now marked “gluten free.” Some are marked with the Yiddish word “non-gebrokts,” which means that the food does not contain matzah and is therefore gluten-free. While Passover is a good time to stock up on some sweets and traditional Jewish foods, don’t go overboard. Because many grains are prohibited on Passover, prepared foods are often lacking in nutrition and taste. Skip the Passover cake mixes, cereals and pasta, as they are usually disappointing. In my family, the worst insult is to say that something “tastes like Passover,” meaning it is as dry as the Sinai desert. I find it’s useful to have a gluten-free Passover shopping list, so I thought I would share mine. Please note that I am not compensated for these recommendations in any way. Also, this is not an exhaustive survey of all gluten-free Passover products. And even though I recommend specific products, always read labels to make sure foods are gluten-free. Click for my gluten-free Passover shopping list.